I am looking to purchase some divides. If you have some strong colonies and don't want to increase your number of hives but have too divide, call me. Strong colonies in May need to be divided or they will swarm. If they swarm you will get no honey. I get 5 frames of brood. You get 5 new assembled frames with Rite cell foundation and whatever we can agree on, cash, equipment or queens. The Dandelion Flow/ Don't let this weed plug you up. In a week or so the dandelions will be out. I have some strong overwintered colonies. 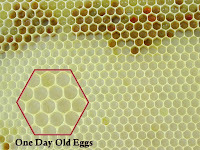 It is important to put honey supers on these colonies. If I don't, a strong colony can fill up the brood nest with honey and leave no room for brood. With no room for brood the colony will start too dwindle and not be able to produce excess honey or have a population to survive the winter. This condition is called being honey bound. I don't have to worry about my package bees though. In this case the dandelions are not a problem. Being honey bound can also happen if the honey supers are put on too late into any strong nectar flow. We can also get honey bound if there are not enough supers on during a nectar flow. The dandelion flow is the first strong flow of the year. The bees are really out working the flowers. If a person is wondering why the feeder pails are not going down during this time is, the bees prefer the real nectar instead of what the beekeeper is giving them. After the dandelion flow is over the feeder pails will be fed on by the bees again. Check out my link to Gary Rueter's Homepage. He has a very good explanation of dividing a colony with nice graphic's. Also the link to the Univ of MN bee lab for some cool bee posters. My links are on the right side of this page. Now that we have installed the package bees it is time to be patient and wait a week before checking on the bees. After a week it is time to light a smoker and check for queen acceptance. Now whenever we check the bees we will light the smoker. Puff smoke at the entrance and lift up the telescoping cover. A few puffs of smoke under the cover should calm the bees a bit. Remove the cover and repeat this procedure to remove the inner cover. The bees should be on the frames centered under the feeder pail. Starting with the outside frame remove the frame. There is likely to be very few bees on this. Slide the next frame back. Slide more frame back until we get to a frame covered with bees. Carefully remove the frame. Don't slam it into other frames. Care must be taken when we are working near or in the cluster of bees. We don't want to kill the queen. Inspect the frame with bees on it. We are looking for eggs. The first frame near the cluster might just have nectar. If no eggs , remove the next frame. Eggs will be deposited on the back of the cells, they will be looking straight out. When we see eggs look at the laying pattern. A frame with most of the cells with eggs present is what we are looking for. If we don't see eggs look at all the frames. Still no eggs? Put the frames back carefully in the same order they were removed. Close up the hive. If we saw eggs we know the queen has been accepted. We don't have to see the queen to know she is there. Her egg laying will tell us this. Eggs - we have a queen. No eggs there could be a problem. If we didn't see eggs on this first visit we will look again after four more days. No eggs yet means the queen is not present. Re queen the hive. Slow release method . Tip: When looking for eggs and larvae and the covering bees won't get out of the way. Lightly blow on the bees and they will clear out of the way. Note the pollen patty I put on 10 days ago is almost gone. Scrape clean the bottom board, notice the boxes on the tele cover. Both boxes had bees in them. A strong colony. Heavy with food. After the reversal another pollen patty. April is the time for spring cleaning and an expanding bee population. This cold weather we have been having has made it difficult to take down the hive to clean the bottom board and has delayed reversals. 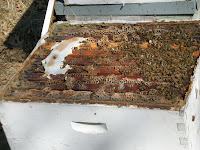 When the weather warms up it is time to break down the hive too clean the bottom board. Debris from the winter has accumulated on the bottom board. 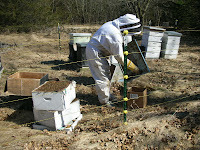 Warmer weather will let the bees use the lower entrance and we have to help them with housekeeping. When we break apart the hive temps should be in the higher forty's. Work quickly and have a plan on what you are going to do before you break apart the hive. Have a box with for the debris. 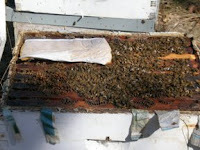 It is not uncommon to have an inch of dead bees and wax capping's covering the bottom board. Leaving debris in the beeyard will attract predators. Smoke the hive and remove the cover. I like to turn this upside down and set bee boxes on it while working the hive. Keep smoking the hive every time a box is broken apart. Don't asphyxiate them with smoke. A few good puffs is usually enough. As the boxes are broken apart don't set them on end. Keep the boxes horizontal with the ground. If the boxes are set on the end with the frames vertical with the ground the cold spring breeze will blow though the frames. This cold breeze can chill the brood and cause death of the brood at the time we are trying too build the population. Get down to the bottom board and use your hive tool to scrape the debris off the bottom board. As we put the hive back together a reversal is in order if we have 4 frames of bees or more. If we have 3 hive bodies, I like to move the two top boxes down and the bottom box to the top. This helps keep any brood together if the queen has layed some brood in the middle box. A two high colony is a simple reversal. Also check for food stores and pollen. We need enough food too keep the bees alive until the dandelions bloom. It is important not too overfeed. Too much syrup can plug up the brood nest and leave the queen with no place too lay. Pollen patties are important. Put them on even if they are bringing in natural pollen. This cold snap is a good example of bees not being able too get pollen and a fall back plan of a pollen patty will help for proper brood production. Package bees will be arriving this month.